The HPGL Import filter is used to convert HPGL data in G code for KinetiC-NC control software. HPGL data files usually have the file ending .hpgl or .plt and are supported by most drawing programs. This type of file was originally conceived to control the drawing plotters and cutting plotters. IN, DF, IP, SC, VS, WU, PW, SP. PU, PD, PA, PR, AA, AR. All other HPGL commands will be ignored. In the list in the upper area, all pens which can be used are listed. A pen in an HPGL file is originally a tool. Each pen can be assigned its own different characteristics. If you don’t change anything, all pens will have the same settings, Tool 1 will be used for all pens and the piece’s zero point is in the lower left corner. By clicking on „Start Conversion“, the HPGL file is changed into G code and is loaded as an NC program in KinetiC-NC. The NC file will be listed in the same list as the HPGL file which is to be imported. So ensure that the HPGL file is in a folder with write permission. And do not import from a CD or a DVD or a folder in which you do not have write permission. The G code created will be assigned a comment and will also inherit attributes from the original file. You can adjust the global values to your needs and to the material. If an imported file contains several pens, you can configure these individually. The pen widths can be assigned in the HPGL file. If your drawing program supports it, you can use these values to easily set the Z depths. As pen width, just enter the desired depth in your drawing program and select this option. If you select this option, you can assign an individual depth for each pen by right-clicking on the pen. If the „Extra tool for each pen“ option is selected, you can select a different tool for each individual pen by right-clicking on the pen in the table above. In a HPGL file the pens can be assigned individual speeds with the VS command. If your drawing program supports this, you can assign each pen with its own speed when you export it. If you select this option, the mill feed will automatically and easily be taken on by each pen. By using this option, you can assign an individual value to each pen. In order to do this, in the list above, click on the desired pen and set the feed individually. This field allows you to enter where the zero point of the piece should be located. It is possible to move the zero point, independent of the entry in the HGPL file, and easily adjust it to the piece. Corel Draw is a very popular drawing program, which unfortunately creates a very shoddy data export. 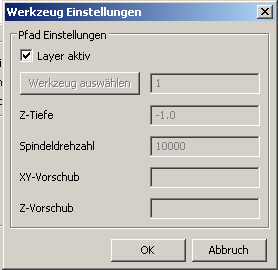 If you have exported from Corel Draw, check this box in order to import the file correctly. If you make changes to the pens or to the global settings, these changes will be saved and automatically loads for the next import. If you do not want this to happen, uncheck the box and you can change the data without saving it. By clicking on the „Reinstate standard values button, all settings will be returned to their original values. In CV mode, the machine will not come to a standstill in curves and on corners, rather, similar to a motorcycle, „the corners are cut“. This means you will get a quicker, smooth movement though the path will not be 100% covered. The maximum permitted error rate can be changed in the machine settings. The NC program will thereby include row numbers. This can prove useful when you want to note your position in the event of interrupting the work and then continuing later. 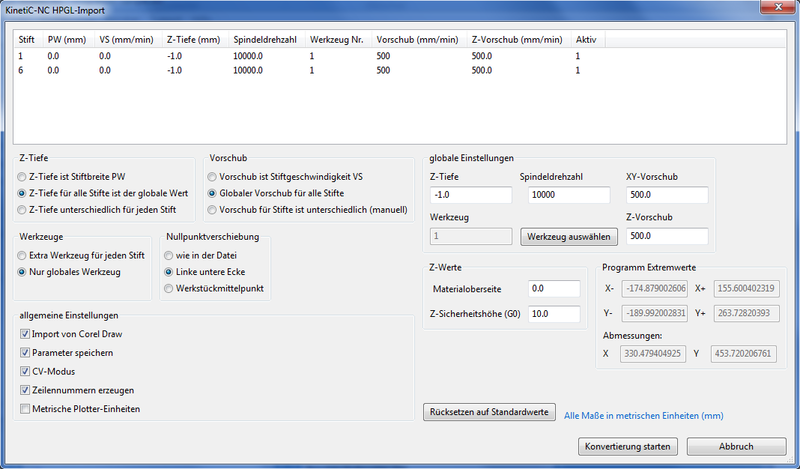 Usually a plotter unit measures 0.0254mm, i.e. 1/1000 inches. There are however programs which designate a unit as only 0.025mm when exported. That is then 1/1016 inches. If your piece is not dimensionally stable and your drawing program uses this metric basis, check the Metric Plot Unit box.